There is nothing quite as delicious as biting into a warm dessert that you know has been made from scratch using fresh ingredients. In our neck of the woods, Amish culture and Amish cooking are a very big deal. There are stands set up and general stores aplenty that sells Amish pies and cakes, all using local ingredients and baked within a day or two of purchase. Let me tell you, they are so good! 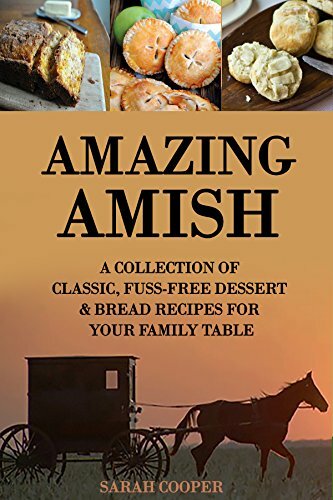 Iâ€™ve put together a book of classic Amish recipes so that you can try your hand at making something â€œold fashionedâ€ and delicious at home. In todayâ€™s busy world, itâ€™s nice to return to simple and classic recipes to put on the table for our families. It doesnâ€™t have to require hours in the kitchen or fancy bells and whistles. You can create something tasty and simple that fills bellies and makes your family ask for more. Order now and and you can have something delicious on the table for dinner!